He’s spent two decades being metal’s living punchline. 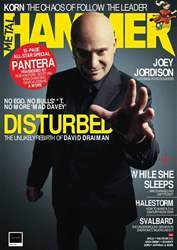 Now, David Draiman is ready to lead Disturbed into the album that could seal their status as one of the 21st century’s biggest bands. And who could have seen that coming? How did the band that brought us Down With The Sickness become one of the biggest successes in modern metal? David Draiman reveals all inside.